I got up this morning feeling confused, displaced. Angie woke me sometime after my 7:30 alarm. “Time to get up,” she sang. She placed a mug of coffee by my nightstand. This is usually my job. I’m the one who gets up early, makes the coffee, rouses the late sleeper beside me to get ready for work. I don’t know why that was my first spoken thought. I had just had strange dreams, part travelogue, part sitcom. Angie and I were in the middle of a desert, gathering up our things, breaking down camp, hurrying to try to catch up with the queue that had moved up some time in the night. When we caught up to it, we were already in Scottsdale, outside a stately old hotel. When we got to the front of the line, there was an older woman, shrill and puffy, who was trying to horn in on our room. She had paid for it, and was insisting on occupying it. I told Angie to wait downstairs while I checked it out. This led to a canned laughtrack: the double entendre of the innocent cad. Upstairs everything was polished wood and inlay, rich carpets and heavy doors. The doors were bowed and sectioned with too many hinges, so as to create a bay window effect when closed. There was a comical scene of me trying to close them as the shrill woman tried to get in, tried to peer inside. I smuggled Angie up into the room via the dumbwaiter. “What day is it?” I asked now. “Tuesday, March 26th,” reported Angie. I tried to think of what Tuesday meant: it came to me slowly. I am in graduate school. I have a variety of classes. I am a teaching assistant in English 101. I have no class on Tuesday. I do keep office hours though. Not that anyone shows up unless a paper is imminent. My office hours were not until 1:30. I tried to go back to sleep. I waved Angie away and told her to wake me again at 9:00. I tried to go back to that hotel in Scottsdale, to picture its old-fashioned luxury, to even laugh along with the imagined audience at the nosy lady and the mix-up. Why were we in the desert originally? There had been a camera or pair of binoculars dangling by its strap from a cactus. I couldn’t fall back asleep. It was the laughtrack that made me think of him. Dad would enjoy hearing this, I thought. He hated laughtracks, shows that told you what to think or how to feel about something. I should call him. I started crying into my pillow. My father died on March 13. Two weeks ago tomorrow. On Monday the 11th He and Joyce were on their way out the door to get some lunch on and he fell down the stairs, hit his head, and broke his neck. Though he was intubated on the scene and kept on life support, he was brain dead instantly. That night the cellular network of the Nelson family lit up like a brilliant synapse. We flew in to Scottsdale the next day, Tuesday the 12th: Sacha from Boston; Hannah from Florida; Angie and me from North Carolina; Rebecca from Seattle; Jessy from Oakland; even Ira, the brother who hadn’t spoken more than a dozen words to him in twenty years, flew up from San Diego (this on the eve of a flight to visit his daughter—my cousin Simone—in San Francisco, where she was scheduled to have a lump in her neck examined). The decision to remove him from life support was an easy one—he wouldn’t have wanted to live for a New York minute as a vegetable, even if he could. And the decision to donate his body to science was also simple: it wasn’t that he was a nuclear physicist, but the fact that they donor organization would cremate for free, and our father, as Hannah pointed out, could never say no to a bargain. On Wednesday the 13th, when I should have been in class—Theory and Research in Composition, followed by my fiction workshop with Wilton Barnhardt—we all said our goodbyes at the Mayo Clinic in Scottsdale, there in the desert, in a room that was, for what it was, rather luxurious. We played him Bach, his favorite. I read to him from the book I had been reading for my class on memoir, The Year of Magical Thinking by Joan Didion. I can’t help but think that the events of the last couple of weeks make a great story, one that he would get a kick out of. I keep fighting the impulse to call him. It feels strange to say it: “my father died,” and though it’s true, and though my brain is only just starting to catch up to the facts, and though I experience the effects of his death as aftershocks, often spaced days apart, the reality is I’m fine most of the time. The reality is I have a lot of support (though I’m not always sure what to do with it; I keep feeling that it’s not me you want, it’s not me who needs the sympathy). The reality is that I’ve also been preparing for this earthquake for a long, long time. Three weeks ago today, Angie and I were vacationing in the Outer Banks. It was my Spring Break. We went to Kill Devil Hills, to the Wright Brothers National Memorial. I had always thought that this was in Kitty Hawk, along with the sand dunes. Not so. 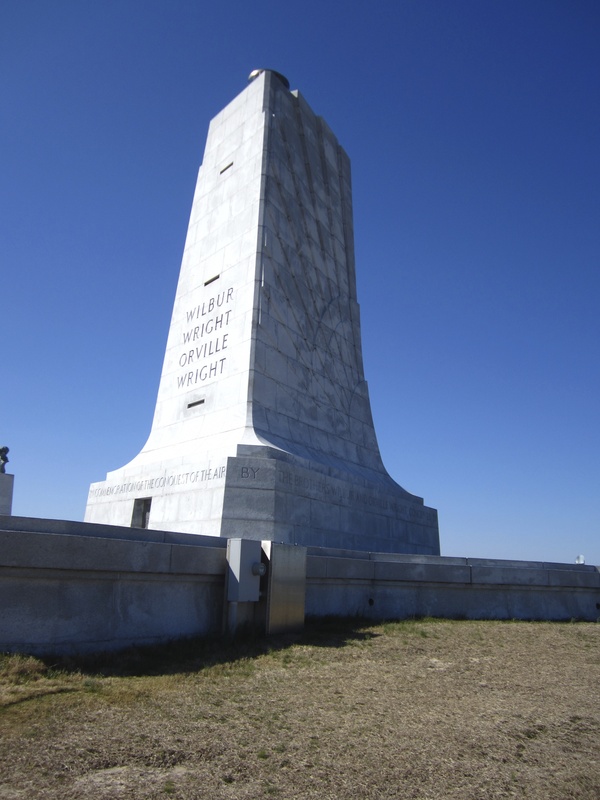 The Memorial is in Kill Devil Hills, on the spot where Orville and Wilbur Wright first flew. The sand dunes are at Jockey’s Ridge State Park, which is in Nag’s Head, a few minutes down the road. Angie had never been to the Outer Banks, but I had. When I was six, my family vacationed there from New Jersey. Our friends, the Goldsteins, were vacationing there too, but I don’t think they came with us; we just met up at certain points. I have vague recollections of that trip: of being the first to discover horsehoe crabs and jellyfish; of houses on stilts that swayed at night and terrified me; of sliding down sand dunes; of the long trek back to the top. The tufts dunes of dry beach grass that lined the shore. Drinking grape soda from a two-liter bottle. Eating saltwater taffy. At the Wright Brothers memorial Angie and I walked up to the top of the hill from where, I had thought, the brothers had launched their flyer. Not so. The hill and surrounding area was all sand at the time; wheels were useless; downward momentum would have failed. They launched from a skid on the flat meadow at the base of the hill. But the hill is where the monument is, a large, squat, stone obelisk that commemorates the two men who figured out how to control pitch, roll, and yaw. “Did you come here when you were a kid?” Angie asked as we wandered up the hill. I immediately resented her for suggesting this. My last conversation with my father, a week earlier, had not gone well. He had called for advice on how to build a website for a client, but was asking all the wrong questions, and was fixed on using the technological equivalent of a paint-by-numbers. I tried to give the best advice I could, but he spoke over me, as he often did. If I tried to interrupt, he’d interrupt. If I tried to speak louder, he’d speak louder, and faster. When that part of the conversation was over and he had what information he thought he needed, he turned to ask how I was doing. I tried to tell him, but he still spoke over me, telling me how he thought I was doing. He got so wound up in the cadence and flow of his own talking that he forgot he had asked a question, and as his voice drifted toward that natural lilt that suggests the end of a phone call, he wrapped up with a jovial, “Well it was good talking to you,” and a goodbye. I had been sarcastic, and shot back, “Well, if you ever want to hear my answer, feel free to call again,” but he was practically deaf and didn’t hear me before he hung up. I did call, and it was the last time I spoke to him. I’m glad I did. And I’m eternally grateful to Angie for suggesting—insisting—on it. He still talked over me, but I listened more carefully. He talked about our vacation there, almost thirty years ago. Grandma Sonya was with us: I had forgotten that. At some point a decision was made to go hang-gliding, and Sonya, that stout little Russian dwarf who never drove a car in her life, was completely game. “She was willing to go hang-gliding,” he told me. I didn’t press him for details. I wish I had. We never did go hang-gliding: was it my mom who put the kabosh on that? Was it my sister and me? I’ll have to ask her. I asked if we had gone to the Wright Brothers Memorial. I told him I remembered it being at the same place as the dunes—”at Kitty Hawk, right?”—and that I definitely remembered the sand dunes. “No, no, we didn’t go to the memorial. We just went to the dunes,” he told me. “And there was a rental house on stilts?” No, he said, “we stayed in a motel near the beach, just a cheap one-story motel.” Images of a teal-blue motel came back to me, the rooms paneled in fake wood. I should have pressed him on the house on stilts: I remember the swaying. Another detail I’ll have to ask Mom. After his recollection, Dad started to move into a more general monologue about what a joy it was to hear from us (“See?” I imagine Angie elbowing me), and how great it was that we were living so well, that we traveled as much as we did, while we could. There was a wistfulness, I remember thinking, in that line, but I let it go. He was so proud of us, of me. Again, he wound up the conversation all on his own. “Well it was good hearing from you. Love you. Bye.” There’s a downward, see-sawing lilt as he does this, an arpeggio that signals the end of conversations. The words varied only slightly, the notes never. Thankfully, my father was a repetitive man. As always, this Passover there will be an empty seat at the table. And maybe a cup of wine that mysteriously vanishes. In a life full of Zak gifts, this is my greatest. Thank you. He was so proud of you. Very powerful. I’m in tears. Thank you for sharing your memories in such a beautiful way. We wish you all the best Zak. I had just finished reading a New Yorker article Philip Roth’s 80th Birthday Celebration by David Remnick (http://www.newyorker.com/online/blogs/books/2013/03/philip-roth-eightieth-birthday-celebration.html?msource=MAG10) when I then read your Pesach homage to your Dad. I can foresee in the not-too-distant future when I can affirm that I knew both Philip & Zak when they were each “up & coming writers”. The sobs, the anecdotes even the occasional guffaw you & your sisters & brother shared with me while at the Mayo Hospital, deepened my avuncular ties to you & at the same time sadden me that I had spent so little time with you all while growing up.